Ideal for large surfaces. Large ﬁlter surface distributed on 6 cartridge ﬁlters ﬁtted with electric ﬁlter shaker. Side brush raising control. Complete left side brush. Suction switch off. Lift ﬂap pedal. Flashing light. Main brush pressure regulation. Indirect back collection. 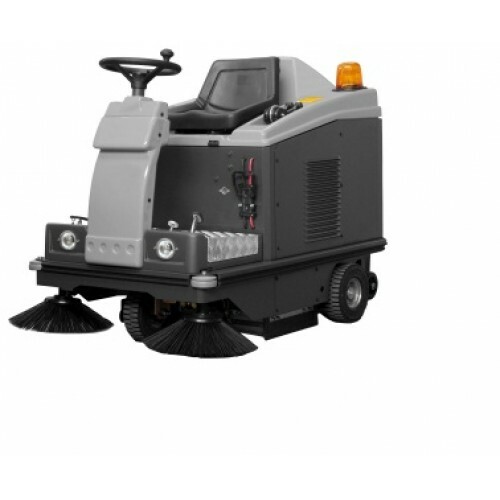 Front dust vacuum system. Quick changing of the main brush and side brush without tools. Long life elastic belts. Suction selection lever. Shock proof steel frame. Traction lever. Antistatic device. Wide collector tank. Heavy duty steel frame. Adjustable seat. Perfectly balanced weight of the components, thus resulting in totally safe quick changes of direction .